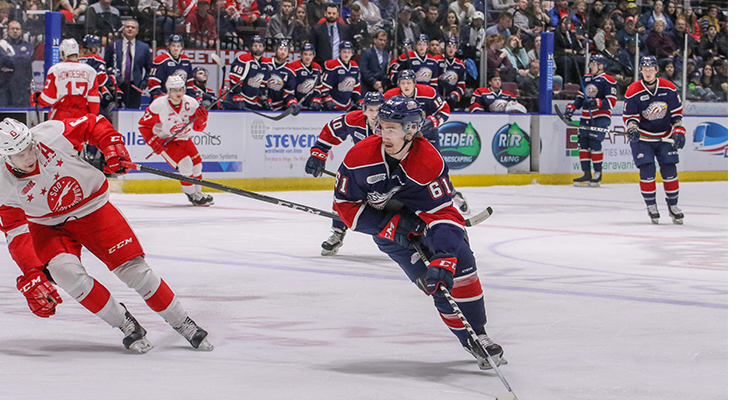 Saginaw, MI – The Saginaw Spirit attempt to close out the Soo Greyhounds in Game Five of the Western Conference Semifinals Friday, April 12. Puck drop from The Dow Event Center is set for 7:05 p.m. The Spirit dropped their first game of the post-season Thursday evening but still hold a 3-1 series lead. 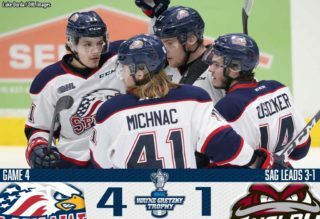 The top-ranked Saginaw Spirit post-season shorthanded unit has killed 30 of the 31 man-power disadvantages in this year’s playoffs. 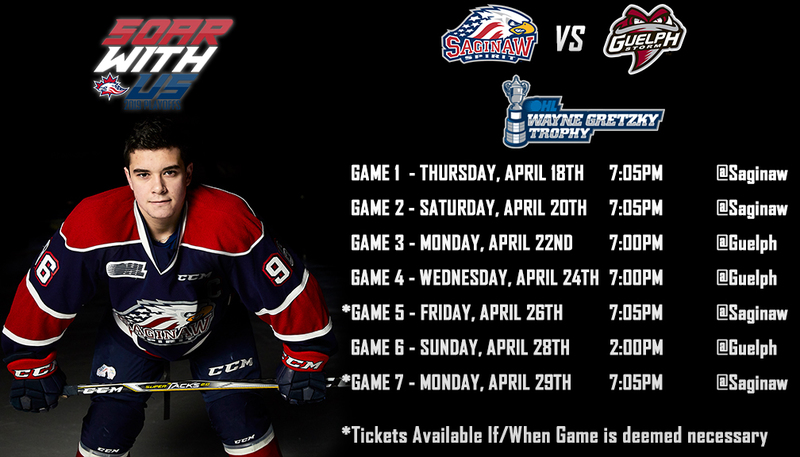 Tickets for Game Five are on sale now on saginawspirit.com, ticketmaster.com, and at the Saginaw Spirit Store at 5789 State Street in Saginaw. The Dow Event Center Box Office is open and selling tickets up until game time. Watch live on OHLLive.com or listen live on the flagship 100.5 Newsradio WSGW and fmtalk1005.com with the voice of the Saginaw Spirit Joey Battaino and Dennis Desrosiers on the call. “Countdown to Faceoff” with host Domenic Papa starts 15 minutes prior to puck drop. The Spirit was held off the scoresheet Thursday for the first time in 77 games dating back to last season’s playoffs. Los Angeles Kings draft pick Matthew Villalta made 25 saves in the Soo’s Game Four victory. Villalta was the last goaltender to shutout the Spirit in Game Two of last season’s playoffs in Round One. Arizona Coyotes prospect Ivan Prosvetov played well in a losing effort Thursday night. The Moscow, Russia native stopped 26 saves on 28 shots which earned the net-minder the game’s third-star honors. Prosvetov is first among Ontario Hockey League (OHL) goaltenders in goals against average (2.20) and second in save percentage (.937) in the post-season. Florida Panthers first-rounder Owen Tippett was held scoreless for the first time this post-season in Game Four. The right-winger tallied at least a goal in all seven of the previous Saginaw playoff games this year. Tippett, who was taken 10th overall by the Florida Panthers in 2017, is second in the OHL with 17 points this post-season. The Peterborough, Ontario native leads the OHL with nine goals in these playoffs. Saginaw captain Damien Giroux is second on the Spirit with five goals this post-season. The Minnesota Wild fifth round draft pick is one of six Saginaw Spirit players with power play goals in this year’s playoffs. 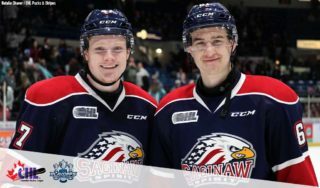 Detroit Red Wings prospect Brady Gilmour leads Saginaw players with 10 assists in the post-season. The Spirit alternate captain is fifth in assists among OHL players this post-season. Former Detroit Red Wings fifth round pick Jordan Sambrook contributed the game-winning goal in the 3-0 Game Four Greyhounds victory. The second period tally was the defenseman’s first point of round two. 2017 Philadelphia Flyers 27th overall pick Morgan Frost played through injury in Game Four and contributed three assists in the victory. The Sault Ste. Marie center has contributed a goal and five assists against the Spirit in round two. 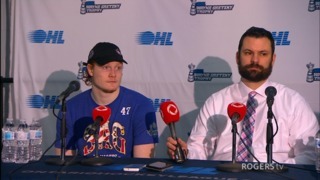 Soo captain Barrett Hayton added a late third period empty-net goal in Game Four on Thursday. Hayton, a 2018 first round pick of the Arizona Coyotes, has a goal in the last two games of the series. The Soo Greyhounds have four players with rights owned by NHL clubs, forwards Morgan Frost (Philadelphia Flyers-signed), Barrett Hayton (Arizona Coyotes-signed), defenseman Mac Hollowell (Toronto Maple Leafs-signed), and goaltender Matthew Villalta (Los Angeles Kings-signed). The Spirit also boasts eight players drafted by NHL clubs, forwards Brady Gilmour (Detroit Red Wings), Blade Jenkins (New York Islanders), Owen Tippett (Florida Panthers-signed), Ryan McLeod (Edmonton Oilers), Damien Giroux (Minnesota Wild), defensemen Reilly Webb (Detroit Red Wings), Bode Wilde (New York Islanders-signed), and goaltender Ivan Prosvetov (Arizona Coyotes).